And here’s what’s for dinner! 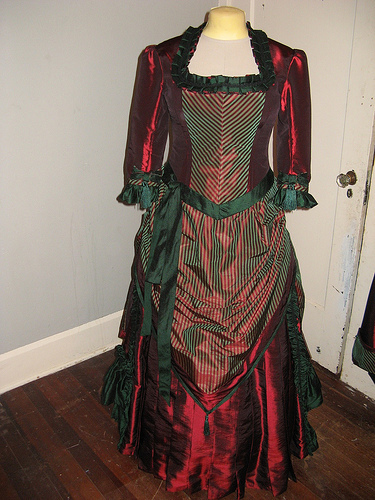 To cap Denise’s new early 1870’s outfit is a matching dinner top. You can see my sketch above with the Picture from Harper’s Bizaar that I used as inspiration. What I liked and used from Harper’s was the lower bodice binding that terminated in a tied bow, and the bows at the elbows. I try to find little nifty trim-y bits that will keep all of my girls from looking like cookies out of the same package. I wanted this top to be more solid colored as a contrast to the day top. The only stripe I used is in the center front and as lining on the el”bows” *grin*. Instead of lining this, I decided to face it. 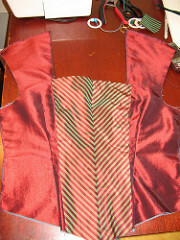 I am going to do this a lot this year, since it is easier to access the seams for alterations, if necessary. I hate alterations, but if a little tweaking can make a difference then it is much better than spending on a whole new dress. There is not much wiggle room in custom fitted garments,l but I do what I can for the people I love. I was able to put all the facing down initially by machine, but that last turning all needed to be put on by hand. Once I had the bodice more or less complete, I then added the decorative facing.This is basically two very long finished bias ribbons. I needed the bias to get it to lay smoothly, so the only twitchy spot was mitering the front point, other wise it laid beautifully, and I even got it to ties like the fashion plate! Sweet! In the middle of all this dinner top madness, I got several wild hairs. 1st, I decided that I was unhappy with the way the over skirt hung, so I pulled the waistband off, moved the side pleats farther forward, took two tucks in the front to make up for that, and re-trimmed the front point. The ladies at TrulyVictorian helped me decide on how to trim the overskirt. The consensus was that the green needed to come to the front of the gown more. I used a couple of ribbons that I had made and added them as flat trim along the font points edge. I also added a little green tassel from a set that I got from MB for this project. They are also at the elbows. 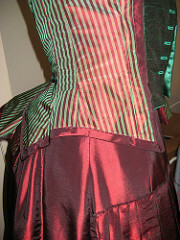 2nd, I added a band of rouched bias green silk up the side of the underskirt. 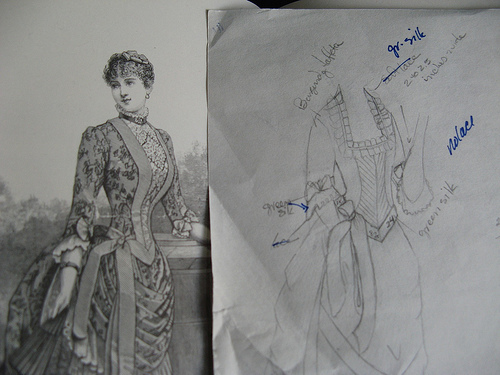 In the original plate, and my sketch there is trim there but I could just not decide what to use. Again the TV ladies helped there. Heather in particular had a pile of fabulous ideas, and this was one of them. 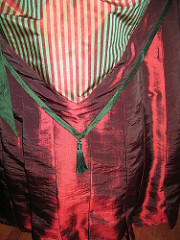 I used some decorative soutache that I have had for years to cover the stitching here and on the box pleated neck frill. I have used it before on Denise’s 1890’s walking ensemble in a more prominent fashion. Here it worked for just this purpose and makes the work look neat. 3rd, I gave Denise a pocket on the day top. Teehee! I was most amused with myself. So, it is now complete, except for the eyelets. I did one, to see if it would even work on the taffeta. Grommets would be easier, but I decided that I just couldn’t. Thanks! And back to work I go.